Magic Actions for YouTube promises to be the most convenient way to watch YouTube videos in the Google Chrome browser. But can it live up to that promise? When you look at the feature set you will notice that it combines several unique options with features that are commonly found in other YouTube extensions as well. Note: The extension tries to get you to install another extension during setup. It is a privacy cleaner which you don't need to install to use Magic Actions for YouTube. Just cancel or skip the setup to avoid doing so. Probably the most unique feature of them all is the option to control the video volume with the mouse wheel. An on-screen display indicates the current volume whenever the mouse wheel is used while the mouse hovers over the video. 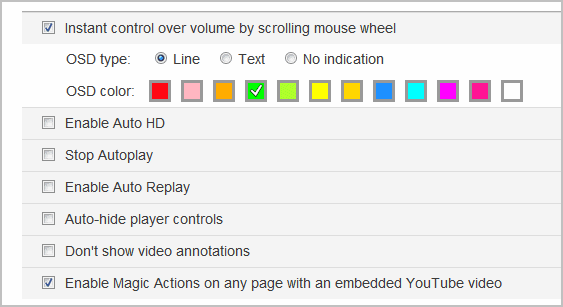 The mouse wheel volume control is compatible with both Flash and HTML5 videos, and works directly on YouTube and on third party sites. You scroll down to with the mouse wheel to decrease the volume and up to increase it. 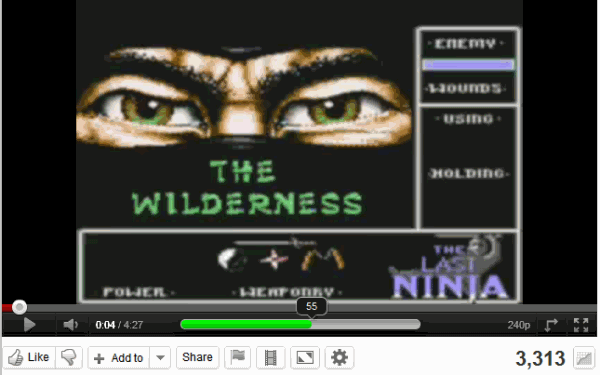 The extension adds new control buttons to the video page that are displayed directly beneath the video player. Opens the homepage of the extension. Opens the YouTube channel of the extension. Opens the options on the developer homepage. Switches to Cinema mode which darkens all of the screen but the video player interface. Expands the video player to full screen for a better viewing experience. Sets the video to repeat. It is unfortunate that the developers have made links the most prominent in the toolbar. They have also switched from an on-page options menu to one that you control on their website which is less user-friendly. While you may not need to open the first two ever, you want to go through the settings at least once to make sure everything is set to your liking. Enable Auto HD and select a desired video quality. Bypass country and use Worldwide/English always. Enable Cinema mode and configure it. Force Flash or HTML5 player. Improve video buffering and preloading. Once you are done setting it all up, you don't really need to go back to the preferences back unless an update introduces a new feature that you want to configure. This means however that the first three buttons are more or less useless at this point in time. The Magic Actions for YouTube extension adds an icon to Chrome's address bar as well. A click on it displays links to the extension's options and your watch history, but also to the browser's plug-in and extension page. Most of the links however are not useful at all. An option to remove it from the address bar is not available. Chrome users who want to try the Magic Actions for YouTube extension can install it directly from the Chrome web store. The extension offers excellent functionality but the developers have gone a bit overboard with promoting their own website, YouTube channel and another extension. An option to remove the links and the address bar icon would go a long way as they don't serve much of a purpose. Still, they are easy enough to ignore once you figured out what they do. Now You: What features are you looking for in a YouTube extension?